Count the omer with swim noodles! I needed a BIG omer counter for a classroom (and maybe the school entrance, too), and this is it. I love abacus-style omer counters because it is a pleasure to slide something across something: I feel like I’ve counted, I’ve moved, I’ve gone from here to there. 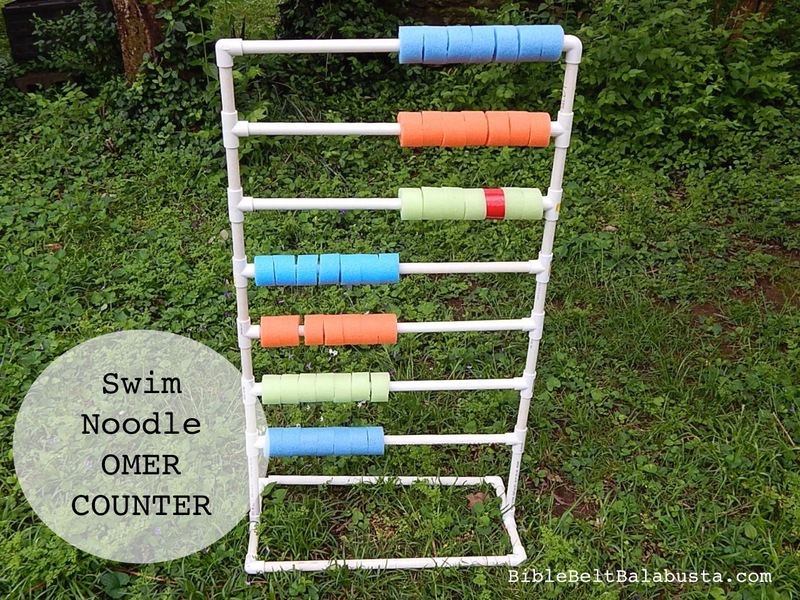 All the more so with swim noodle “cookies” and my beloved PVC pipe. The two materials create just enough friction. Count up from the bottom: from second day Pesach up to Mt. Sinai and Shavuot. I’m keeping this one simple. I like the raw PVC and the obvious pool noodle cookies because kids are attracted to both. Fancier folk can modify the design by wrapping the discs with tape, adding numbers, or color-coding the discs to reflect special calendar days or the “Kabballah color” of that week. I did wrap the 33rd disc with red electrical tape, which will hopefully connote fire for Lag BaOmer. 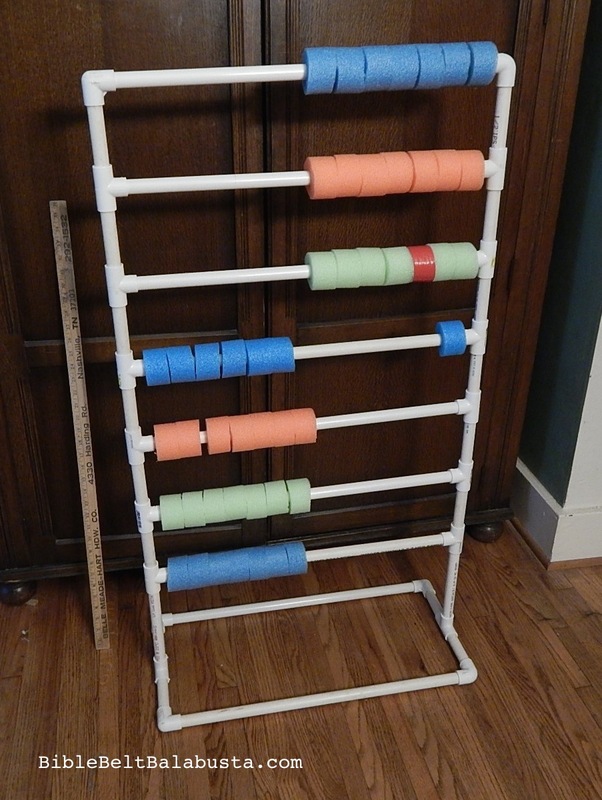 This is my prototype made at home, but it would be a great project for a class, especially if the students have to build it without much instruction. So many details to figure. My unit stands at about 45″ high. The seven rungs are 22.5″ long because I already had a PVC base with this dimension and I wanted to reuse it. Each rung is separated from the next by a 4.5″ piece of pipe and the two T-joints. All joints are hand-tightened, but if you’ve made a masterpiece and don’t want it to fall apart when kids fling themselves on it (as they will), use PVC cement. I rather like the omer counter to be a project kids have to disassemble and reassemble every year: it makes them part of the process, it makes them think and count and ask. As does my PVC Hanukkah menorah project (my first PVC) which was designed to be put together and taken apart by kids. The noodle counters: How wide? We tested different noodle cookie widths to see which was the most satisfying to pull across the pipe: 1/2″, 1″, 1.5″ and 2″. The favorite was 1.5″. (Good luck cutting them straight. Mine are all a bit wonky.) With 49 discs, I dissected less than 1 full noodle per the three colors. (Dollar Tree noodles are 49″.) Keep the extras for your Swim Noodle Menorah. 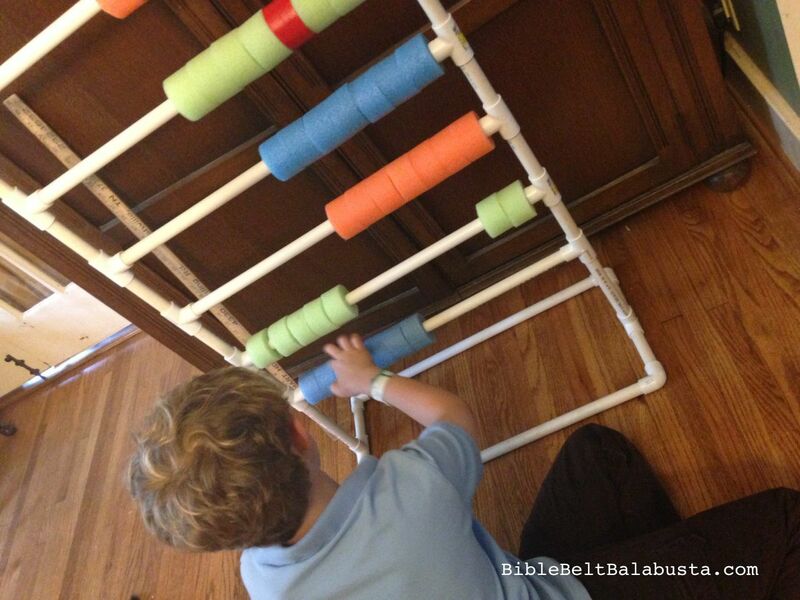 Tip: test your swim noodles to be sure the interior hole can handle your PVC pipe. My noodles are from Dollar Tree (and only come in three colors), and they fit 1/2″ pipe fine but different brands of PVC have different surface finishes. Some are rough, some are slick. And weirdly, my Dollar Tree peach noodles were tighter than the Dollar Tree blue and green. I also created LEGO omer counters (cupboard doors version and a minifig head version) a rubber band Rainbow Loom omer counter prototype, and I compiled a round-up of kid-friendly DIY ideas from friends, teachers and other nice folks. This entry was posted in Activity, Crafts, Lag B'Omer, Passover, Shavuot and tagged omer. Bookmark the permalink. You are so brilliant sometimes it just makes my day!!! I was thinking you could also get other colors of swim noodles to cut up, so that each week corresponds to the color of the Sefirah of that week. Here is one Kabbalistic assignment of colors to each Sefirah of the weeks, from Moshe Cordovero. I’ve seen other versions with other colors. Thanks, Riqi! Yes, you were exactly whom I had in mind when I suggested the color-coding by sephirot. It could be done with duct tapes, which come in so many groovy colors now.